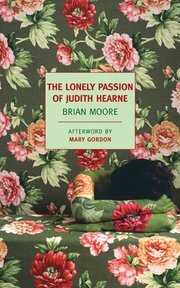 The Lonely Passion of Judith Hearne is the third book chosen by the book club I recently joined: we began with Morley Callaghan’s Such is My Beloved, and in January we discussed Graham Greene’s The Power and the Glory. Our idea (a good one, I think) is to choose books with at least some connection to each other. So we began with an idealistic but ultimately disillusioned priest and moved on to another priest who is neither idealistic nor any kind of ideal–except, perhaps, in his inability to abandon his vocation in the face of every imaginable discouragement. We looked to Brian Moore next on the understanding that he was one of Greene’s favourite novelists, and when we saw that Judith Hearne is a drunk who endures a crisis of faith, well, it seemed the perfect choice, providing continuity but, with its female protagonist, a nice dose of difference as well. For as the years wore on, there was not much to be cheerful about, old friends dying off, young men a thing of the past. . . . And all the things Miss Hearne used to dream about in those lonely years with her poor dear aunt: Mr Right, a Paris honeymoon, things better not thought of now, all these things were slipping farther away each year a girl was single. So she cheered herself up as best she could and if she overdid it, it was a private matter between herself and her confessor, old Father Farrelly, and he was understanding, he liked a drink himself, right up to the end . . . The rooming house where Miss Hearne (temporarily sober) takes up residence at the novel’s beginning is vividly recreated, from its dreary clutter (“little lace doilies on the tables and lamps with pretty pastel shades . . . a big enamel china dog on the mantelpiece and a set of crossed flags on the wall”) to its odd and somewhat creepy inhabitants, including the landlady’s truly creepy son Bernard (“all bristly blond jowls, tiny puffy hands and long blond curly hair, like some monstrous baby swelled to man size”) and the landlady’s brother, James Madden, recently returned from America. Madden is a man on the make, eager to promote himself with inflated stories of New York and his own success “in the hotel business” there (in fact, he was a doorman who got a little money in a settlement after being by a bus). Night gave a special flavour to Mrs Henry Rice’s nest. The coloured lampshades glowed orange, blue and green and flames yawned noisily up the chimney. already a state of nightly undress was evident. A pillow had been laid on a sofa and a blanket was folded beside it. In the centre of the room, kneeling on a rug, was Bernard, stripped to his bulging middle, his head immersed in a towel. A big enamel basin of soapy water stood beside him on the floor. Poor Miss Hearne hardly knows where to look–and neither did we. His hulking, dripping, bulging presence seems ominously significant, but we couldn’t settle on the nature of that significance: why should he be the one who brings on the novel’s crisis? Given the novel’s emphasis on women’s economic and sexual powerlessness, it seemed plausible that he embodies men’s advantages, in which case it is interesting that his cruel and selfish behaviour is enabled by his mother. Then she scrambled off the bed, shaking, took a glass from the trunk and scrabbled with her long fingers at the seal, breaking a fingernail, pulling nervously until the seal crumbled on the floor and the cork lay upended on top of the bedside table. She took off her clothes quickly, wise in the habits of it, because sometimes you forgot, later. She pulled on her nightdress and dressing-gown, sat quietly by the fire, shaking a little still, but with the rage, the desire of it. Then, while the bottle of cheap whiskey beat a clattering dribbling tattoo on the edge of the tumbler, she poured two long fingers and leaned back. The yellow liquid rolled in the glass, opulent, oily, the key to contentment. She swallowed it, feeling it warm the pit of her stomach, slowly spreading through her body, steadying her hands, filling her with its secret power. Warmed, relaxed, her own and only mistress, she reached for and poured a tumbler full of drink. Moore handles her binge brilliantly: we don’t realize until she drags herself downstairs much later that she has been, as Mrs Rice slyly remarks, “singing and talking away to [herself[ as happy as a lark. . . . louder than the wireless.” It’s just a tiny bit funny to realize how she has given herself away, but it’s painful to watch her cling to her dignity when we know it is too late. It was as though the old sacristan, keeper of secrets, knew he had no need to genuflect again. The lights were out, the people had gone home, the church was closing. In the tabernacle there was no God. Only round wafers of unleavened bread. She had prayed to bread. The great ceremonial of the Mass, the singing, the incsense, the benedictions, what it if was show, all useless show? What if it meant nothing? Like the sacristan, Father Quigley leaves the church without reverence (he has a golf game to get to), adding to her fear that “they both knew there was no need to bow, as though the tabernacle was empty”: “Was it? Was there nothing to pray to?” And so Miss Hearne, in a moment of defiance, approaches the altar and issues a challenge: “Show me a sign.” The rest of the novel follows her as she tests God–withdrawing her savings, moving into a ritzy hotel, and drinking herself into some rare moments of honesty. Eventually, deposited back at the church, she not only approaches the altar but attacks it in a drunken rage, tearing at the door until her fingers bleed. We debated whether there’s something heroic, or at least courageous, about Miss Hearne. It’s not an easy question. Her challenge is not a principled one: she rebels, not against the social rules and taboos that have reduced her to her pitiable state, but against her own unhappiness (she remains just as class-conscious as ever, for instance). And yet there’s something astonishing about the spectacle of her confrontation with a God she can neither believe in nor abandon; her tearing at the tabernacle door might be seen as her scrabbling also at all the shams and pretenses of her society and her life, trying to see what substance they really have. If you do not believe, you are alone. But I was of Ireland, among my people, a member of my faith. Now I have no — and if no faith, then no people. No, no, I have not given up. I cannot. For if I give up this, then I must give up all the rest. That missing word (“Now I have no –“) is crucial, I think: even to herself, she cannot claim her own loss of faith. Instead, she choose, not belief itself, but the appearance of belief and the limited comfort of belonging, rather than the martyrdom of honesty, in which there might have been some moral heroism to offset the otherwise unrelenting bleakness of her story. Next up for our group: Elizabeth Bowen’s The Heat of the Day. We decided to stay in that mid-century period, and Bowen is “Anglo-Irish,” so that’s another continuity. I think we all hope there’s no religious despair in this one. Previous Article Happy OLM-iversary to Me! I went through a Brian Moore phase years ago and I remember that I was struck by how well he wrote his women characters. Annoyingly, religion is usually a big feature of any books written by Irish writers. You are golden with Heat of the Day. No religious despair, just fabulously opaque Bowen syntax. Supervising a Senior Thesis on it right now and reminded how much I love it. Oof. I own a copy of this book and am looking forward to reading it, but I’ll make sure not to be in a sad, melancholy state of mind when I pick it up!